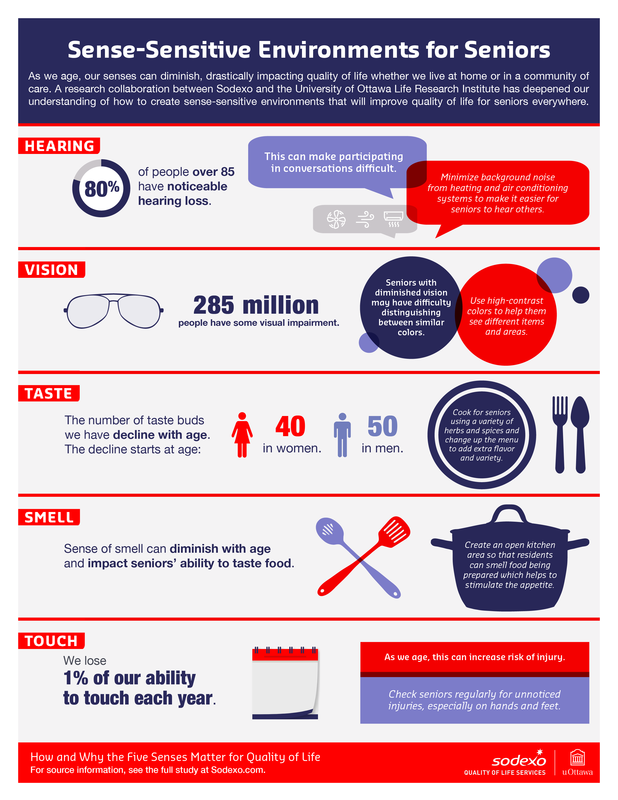 LONDON, October 16, 2017 /3BL Media/ - Sodexo, world leader in quality of life services, and the University of Ottawa Life Research Institute today released the first comprehensive study of how the five senses impact quality of life for those living in long-term care communities. All five senses can diminish as we age, and “How and Why the Five Sense Matter for Quality of Life: A Guide for Long-Term Care Communities” reveals the importance of understanding sensory impairments when creating environments for seniors, whether at-home or in a long-term care community. Founded in 1966 in Marseille by Pierre Bellon, Sodexo is the global leader in services that improve Quality of Life, an essential factor in individual and organizational performance. Operating in 80 countries, Sodexo serves 75 million consumers each day through its unique combination of On-site Services, Benefits and Rewards Services and Personal and Home Services. Through its more than 100 services, Sodexo provides clients an integrated offering developed over 50 years of experience: from foodservices, reception, maintenance and cleaning, to facilities and equipment management; from Meal Pass, Gift Pass and Mobility Pass benefits for employees to in-home assistance, child care centers and concierge services. Sodexo’s success and performance are founded on its independence, its sustainable business model and its ability to continuously develop and engage its 425,000 employees throughout the world. Sodexo is included in the CAC 40 and DJSI indices.